Campo Corto Tuscan extra virgin olive oil is robust, rustic, & deeply satisfying. 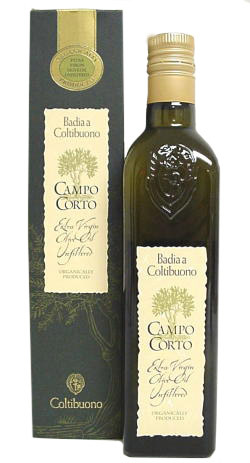 Campo Corto Italian olive oil evokes the life & landscape of Badia Coltibouno's medieval home & Tuscan cooking. Campo Corto olive oil is bold with an intense peppery finish. Campo Corto olive oil is rich in early-harvested frantoia olives & is Coltibuono's oil "con brio"... Tuscan backbone. Serve Campo Corto olive oil on roasted meats, pork, hearty sausages, salami, prosciutto, & bruschetta (freshly oiled grilled country bread). Campo Corto is an unfiltered, organic extra virgin olive oil.